There’s a theme running through nearly all of my coaching relationships right now. Nearly every client is, in some way, owning how spectacular they are – what great leaders, how much they have to contribute, how successfully they can manage their teams, the contributions they’re making at work and in their lives. It’s amazing to witness. Sure, they all have personal and professional challenges. They all have an “evil twin,” as I refer to it – an expression of their personality that is less than effective. We all do. The extrovert who can’t stop talking. The introvert who sits silently in a meeting while thinking, but not sharing, great ideas. The gentle leader who is at times too gentle. The charismatic leader who can tell inappropriate jokes. The direct leader who can be domineering at times. There are strengths in each and every individual that they’ve yet to fully realize, and it’s inspiring to watch as these strengths are revealed. And so I agree with Thomas Edison. I have come to believe that we all are capable of so much, we just sometimes stop ourselves, or get in our own way. We’re all capable of doing more, accomplishing more, being even more ourselves (in a more vibrant, successful way). Of stepping into our own power and astounding ourselves. Sometimes it takes courage and a willingness to move outside of our comfort zone. Sometimes it takes small steps towards a large goal. Sometimes it take conquering underlying fears and misbeliefs about ourselves and the world. Sometimes it only takes encouragement and support. Sometimes it takes a plunge into unchartered waters. And sometimes it only takes a willingness to try. It’s a gift to witness others realize all that they’re capable of. It’s a gift to do more of the things I’m capable of myself. Let’s astound ourselves. What are you capable of? What more? Astound yourself – do and be all that you can. 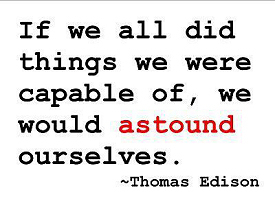 How have you astounded yourself recently? Astounding yourself takes support – get yours by contacting Robyn at rmcleod@chatsworthconsulting.com.